The prawn cocktail may have fallen from favour as a sophisticated appetiser, but it could soon be back in fashion as a component of bio-fuel. Scientists in China are reporting that a catalyst made from prawn shells could transform production of biodiesel fuel into a faster, less expensive, and more environmentally friendly process. Notice how they didn't claim it would be in any way less smelly, though. Dr Xinsheng Zheng and colleagues at the Hua Zhong Agriculture University in Wuhan claim to have developed a new catalyst produced from prawn shells. In laboratory tests, the seafood cocktail converted rapeseed oil to biodiesel faster (89 per cent conversion in three hours) and more efficiently than some conventional catalysts. The current biodiesel production process requires catalysts to speed up the chemical reactions that transform soybean, rapeseed and other plant oils into diesel fuel. Traditional catalysts cannot be reused and must be neutralised with large amounts of water, leaving behind large quantities of polluted wastewater. 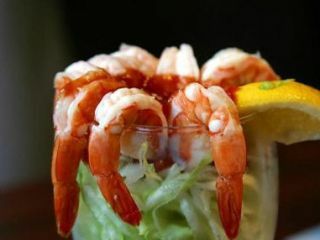 China is the world's leading producer of prawns, farming over a million tonnes of the little pink beauties every year. However, intensive prawn farming has been blamed for the loss of mangrove habitats in Thailand, the depletion of wild fish stocks and intensive coastal pollution.